Rattlesnakes are a group of venomous snakes native to the Americas. They live in diverse habitats from southwestern Canada to central Argentina. The biggest concentration of rattlesnakes is in southwestern United States, in the deserts of Arizona and Utah. Our rattlesnake is a juvenile in an early stage of development, hence the name ‘young rattlesnake’. Rattlesnakes all share one physical characteristic from which they derive their name; their rattle. This ‘rattle’ does not function in the same way a toy rattle does; it is not tiny objects moving around inside the tail which create the rattling sound, but the shape of the actual ‘rattle’ itself. Every time the rattlesnake sheds a layer of skin it adds another segment to its tail. The tail is made of keratin, the same substance found in human fingernails and hair. When this tail is held upright the rattlesnake vibrates and these loosely interlocked segments create the distinctive sound it is famous for. Rattlesnakes are just one of the 600 known species of venomous snakes. 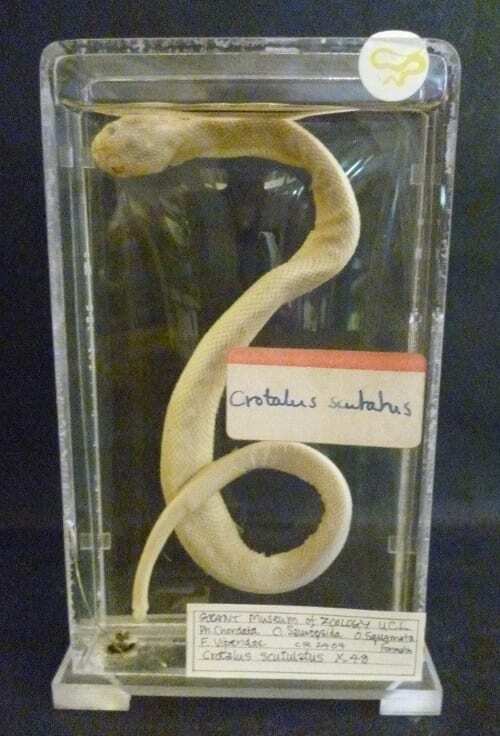 The venom of a rattlesnake very rarely causes deaths in humans, however it is important rattlesnake bites are treated quickly. If antivenom treatment is given within two hours of the bite, the probability of recovery is greater than 99%. Rattlesnakes use their venom when hunting small rodents and lizards – they can strike at speeds of five-tenths of a second and then, with the prey paralysed, swallow it whole. Rattlesnakes are coldblooded. They depend on the sun for warmth and shaded areas to cool off. As the range of rattlesnakes is so geographically large they naturally live in different types of habitat. Those in temperate zones, where temperatures can drop to 4°C, enter a period of brumation. Brumation is a survival strategy for rattlesnakes when the climatic conditions become unsatisfactory. This adaptation is present in other cold-blooded (ectothermic) animals and is similar to a hibernation period. Rattlesnakes spend their brumation periods in places such as burrows, rock crevices and caves; these areas are known as ‘hibernaculum’, which derives from the Latin word and means ‘tent for winter quarters’. Rattlesnakes become extremely lethargic when they enter a brumation period and their metabolism drops considerably. To compensate for this loss of body heat they huddle together in large groups, sometimes numbering in the hundreds. People might assume that in the animal kingdom, venomous snakes, reptiles and spiders are the biggest danger to humans. A recent study from Stanford University however proves this is not the case. On average there were 1610 deaths per year caused by animals in the US between 2008 and 2015. This means 4.8 in every 10 million deaths were caused by animals in this period. 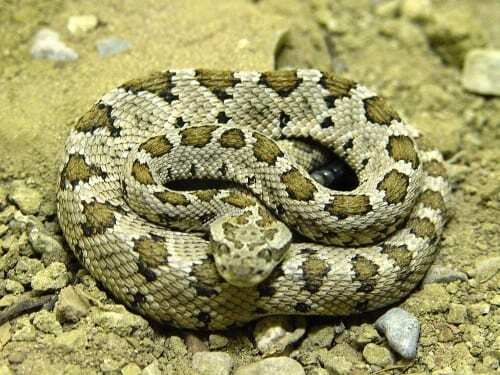 Of these 1610, only 48 were caused by venomous snakes whereas 924 were caused by nonvenomous animals. The study shows the category of ‘other mammals’ which includes cows, horses and racoons are responsible for 576 of these deaths, making them the most dangerous group. In short, farmyard animals are more dangerous than venomous snakes. Watch out for those sheep. An Update on Fatalities Due to Venomous and Nonvenomous Animals in the United States (2008–2015) Jared A. Forrester, MD; Thomas G. Weiser, MD MPH; Joseph D. Forrester, MD, MSc.